As the days grow longer, the temperatures rise and the ground moisture remains high, dormancy gives way to new growth. Spring rains may drive me from the tree tops, but once on the ground I grab my shovel and start lifting small trees and shrubs. Follow these tips for a successful transplant and planting experience. 1. Select young, healthy trees. 2. Prepare the new planting hole first, before digging up the tree to be transplanted. 3. Dig a large root ball, measuring 10 inches in diameter for every inch of stem diameter. 5. Transport the tree carefully, avoiding damage to the root ball. 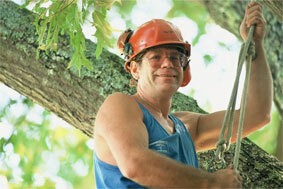 Employ extra help and special equipment such as a spader, dolly or sling. 6. Plant the root ball on a solid footing and at the same depth as before. If the planting hole is too deep, backfill with compacted dirt. Mulch is a valuable promoter of plant and tree growth and can help stabilize newly planted trees and shrubs.When you return leaves, chippings, and unwanted plant matter back to the earth in the form of mulch it facilitates a plant’s good health. As mulch decomposes, it supports a community of animals, worms, insects and fungi that add nutrients to the soil. If you’d like recommendations for transplanting and care of your trees, give us a call. And of course, planting and transplanting does take some time and effort—we’ll gladly do the work for you. Our services include deadwood and diseased limb removal; reducing crown size, cutting back and elevating lower limbs; thinning and removing structurally weak limbs; fruit tree pruning and tree removal. Plus, small tree and shrub planting or transplanting; planting bed preparation. We also offer mulch delivery.